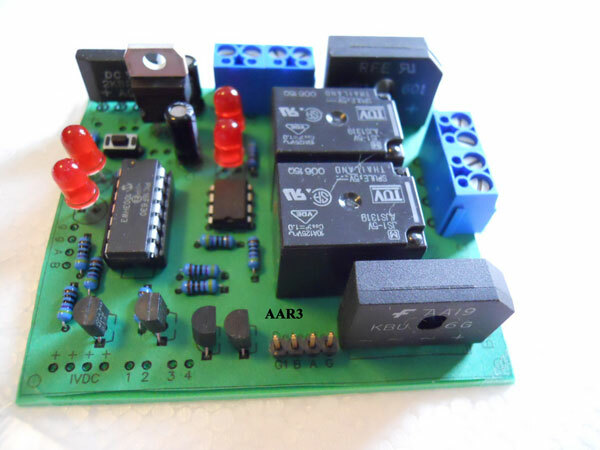 The Bakatronics LLC AAR3 is a MicroController based control system designed for ease of installation and operation. For all scales HO, N, G, Z and others that run on DC power using up to 6 amps. The unit operates by sensing the current going thru the control unit to the track blocks. When current is detected, the unit begins the selected pre-programmed sequence. The standard unit includes selectable sequences that perform Point to Point reversing, Point to Point reversing with adjustable delay, Point to point with adjustable delay and a Station Stops in both directions (optional BKD-2000 detector required for Station Stops). The AAR3 unit senses current to detect the engines position, it is not light sensitive and requires no adjustments for light or other external conditions. For basic reversing of a Point to Point layout, only four wires to the layout are required. One to the common rail and three to the opposite rail insulated blocks, one to the left end block, one to the right end block and one to the center block. If adding a Station Stop, each stop will require an additional two wires and to an insulated block. The unit may also be configured to run an endless loop in a single direction and stop at stations along the route as desired. Installation Note: The AAR3 unit is designed to operate with Locomotives & Trolleys wired per NMRA standards. It has been reported to us that certain Trolleys are wired in reverse and require a change to the connections to the AAR3. If your loco or trolley starts up in the opposite direction that shown in the installation diagram with AAR3, the wires to track blocks "L" and "R" will need to be reversed in order for the sensors to work and stop the train at each end! Fully assembled rigid circuit board (2 5/8" X 3" X 1" High). Terminal Block Input and Outputs for easy connections. Current Sensing to eliminate optical sensors & adjustments. Point to Point, Point to Point with adjustable delay. Includes one set of outputs for flashing crossing lights, either bulb type or LED will work. Includes an output for a single Tortoise Switch machine to lower and raise crossing gates. Additional programs are available as options. The unit is designed to work with most standard model railroad Power Packs. The power pack should have a variable DC supply with enough power to run the train engine and a 10-18 volt fixed DC or AC accessory output to power the AAR3 circuit. If the output is over 18 volts, a voltage reduce may be required such as our FK815. If the power pack does not have an accessory output, a separate power supply can be used. Typical installation diagrams are included with the ARR3 system. BKD-2000 Current Detector is required for Station Stop(s). Only one Detector is required for multiple stops in both directions. A simple single pole double throw switch can be used to turn stops on & off if desired. Tortoise Switch Machine control for automatic switching, crossing gate control or other animation.